In the run up to Magna Carta: Essex Connections we take a more detailed look at the Essex connections of Hugh de Neville, a friend of King John who eventually rebelled against him. 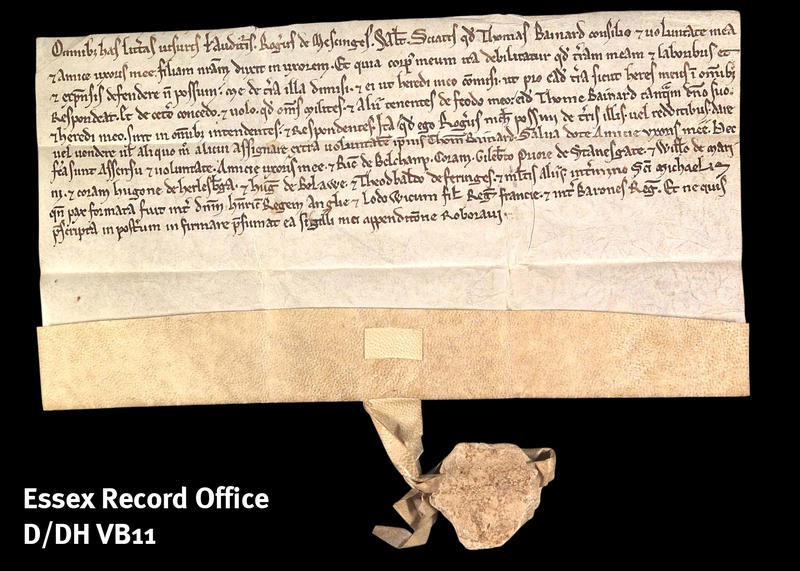 Hugh de Neville appears a witness in the royal grant of 2 May 1203 that we hold here at ERO (D/DB T1437/1). He was King John’s Chief Forester, one of the great officers of state, and is named in Magna Carta as one of John’s officials – the men whom the chronicler Roger of Wendover referred to as the king’s ‘evil councillors’. One of the aims of Magna Carta was to curb the powers of royal positions such as Chief Forester. 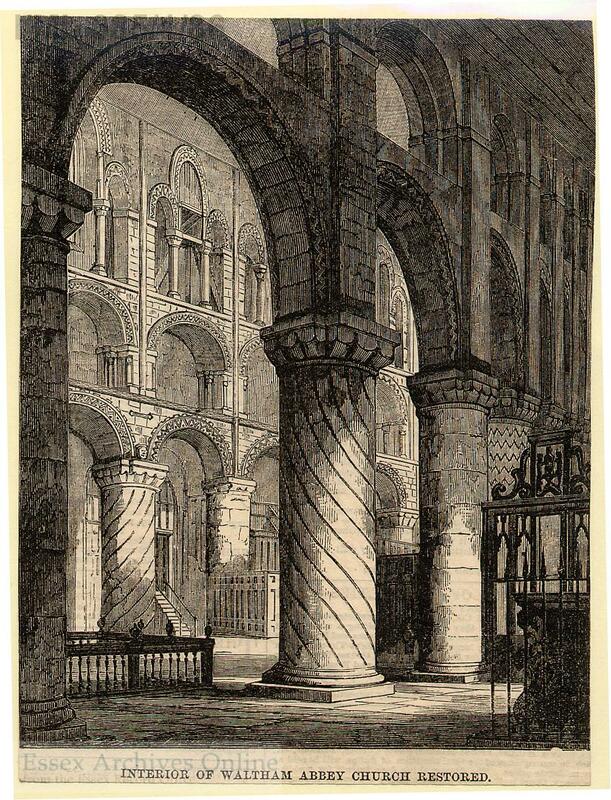 Before John’s reign, Hugh de Neville had served briefly under Henry II, then throughout the reign of Richard I, fighting with him on the Third Crusade. The Essex historian Revd. Philip Morant records that ‘he performed a valorous exploit, by shooting an arrow into a Lion’s breast, and when he rose against him, catching him by the beard, and running his sword into his heart’. This feat was represented on his seal. Hugh was given lands by both Richard and John, many of them in Essex. Over time he acquired the manors of Langham, Wethersfield, Little Hallingbury and Abbots in East Horndon and served as sheriff of Essex, 1197-1200 and 1202-1203. Despite being on friendly terms with King John for most of his reign, de Neville appears to have suffered as a result of John’s philandering. John had a reputation for forcing himself on the wives of his courtiers. A French chronicler wrote that he was ‘too desirous of fair women … by which he brought great shame upon the highest men of the land, for which he was much hated’. A chronicler in Yorkshire wrote of John that he ‘deflowered the wives and daughters of the nobility, spared the wives of none whom he chose to stain with the ardour of his desires’. The Oblate Roll for Christmas 1204 recorded that Joan ‘the wife of Hugh de Neville gives the lord King 200 chickens that she might lie one night with her lord’ (i.e. paying the King to allow her a night with her own husband). John moved quickly to rescind the Magna Carta and the rebel barons invited Prince Louis of France to take the English throne. Louis arrived with an army in May 1216, and this is when de Neville finally abandoned John and joined the rebel barons. When John died and his son became Henry III, de Neville pledged his loyalty to him. De Neville died in 1234, and was buried in Waltham Abbey. There is more to come in our Magna Carta series, but in the meantime get in touch on 033301 32500 to book your ticket for Magna Carta: Essex Connections. In the run up to Magna Carta: Essex Connections we take a more detailed look at the Essex connections of Geoffrey de Mandeville, one of the rebel barons. One of the most radical things about Magna Carta was that the rebel barons chose 25 representatives to ‘observe, hold and cause to be observed, the peace and liberties which we have granted and confirmed’. King John was not trusted and the barons were to ensure that the promises made were kept by distraint if necessary. Distraint is the process by which property can be seized to pay money owed, but can also be used to ensure that an obligation is carried out. It was a well-established practice in the Middle Ages, but Magna Carta extended its use against the king by his subjects. Among the 25 Magna Carta barons there were six with strong Essex connections – Robert FitzWalter, Geoffrey de Mandeville, Earl of Essex, Robert de Vere, Earl of Oxford, Robert de Mountfitchet, John FitzRobert and William de Lanvallei. In addition another four – Richard de Clare, Earl of Clare and his son Gilbert de Clare and Roger Bigod, Earl of Norfolk and his son Hugh Bigod, also held lands in the north of the county, although they were more usually associated with Suffolk and Norfolk. Here we look at Geoffrey de Mandeville and his father, Geoffrey FitzPeter, who we mentioned in our recent post on our two documents from the reign of King John. Both of the 1203 documents we have mention Geoffrey FitzPeter, who served as justiciar under both Richard the Lionheart and King John. The justiciar was the chief political and judicial officer of the king, roughly equivalent to today’s prime minister. The justiciar was accustomed to govern the country in the king’s absence. The Essex historian Revd. Philip Morant in 1768 described FitzPeter as the ‘firmest Pillar of the realm, generous, skilful in the laws, and in money and everything else and allied to all the great men of England either in blood or friendship’. Geoffrey FitzPeter had married Beatrice de Say who was the great-niece of Geoffrey de Mandeville, 1st Earl of Essex. When Geoffrey de Mandeville’s youngest son William, 3rd Earl of Essex died without an heir, his extensive lands in Essex and elsewhere were disputed between two branches of the de Say family. Geoffrey FitzPeter, with his royal influence, won out, and King John appointed him Earl of Essex on his coronation day in 1213. His sons Geoffrey and William both assumed the name de Mandeville and both succeeded him as Earl of Essex. His eldest son Geoffrey de Mandeville was one of the 25 barons appointed to ensure that King John kept to the promises made in Magna Carta. It is not surprising to find Geoffrey de Mandeville on the rebel side in 1215. His first wife Maud was the daughter of Robert FitzWalter, another important Essex landowner and effectively the rebel leader (more on him and his daughter coming soon). After Maud’s death, Geoffrey married Isabella, the divorced ex-wife of King John. The marriage was probably forced upon him, and John charged him a ruinous fine for the privilege. 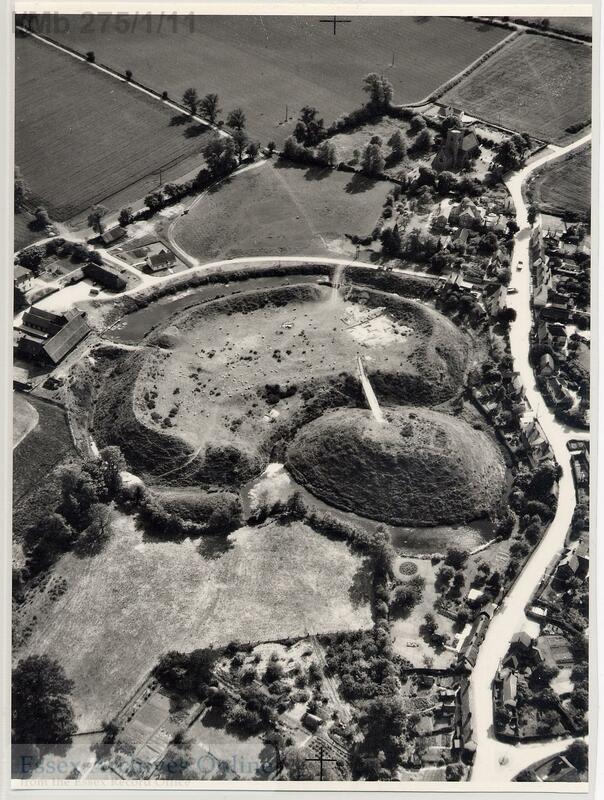 In December 1215 the de Mandeville castle at Pleshey was besieged by the royal forces. Geoffrey was killed at a tournament in February 1216 and was succeeded by his brother William, another opponent of King John, who fought royal forces in Essex in 1216. There are more posts to come exploring the Essex connections with the Magna Carta, but in the meantime give us a ring on 033301 32500 to book for Magna Carta: Essex Connections on Saturday 23 May. 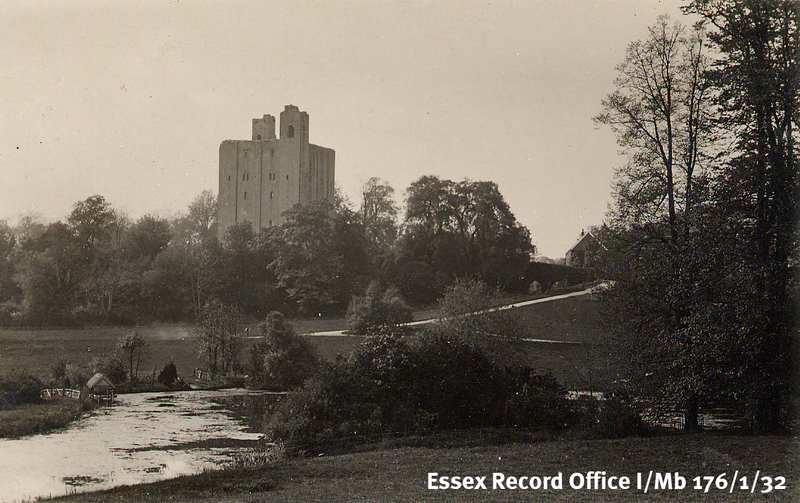 The earliest document we look after at ERO is over 1,000 years old – but it is nothing to do with Essex. 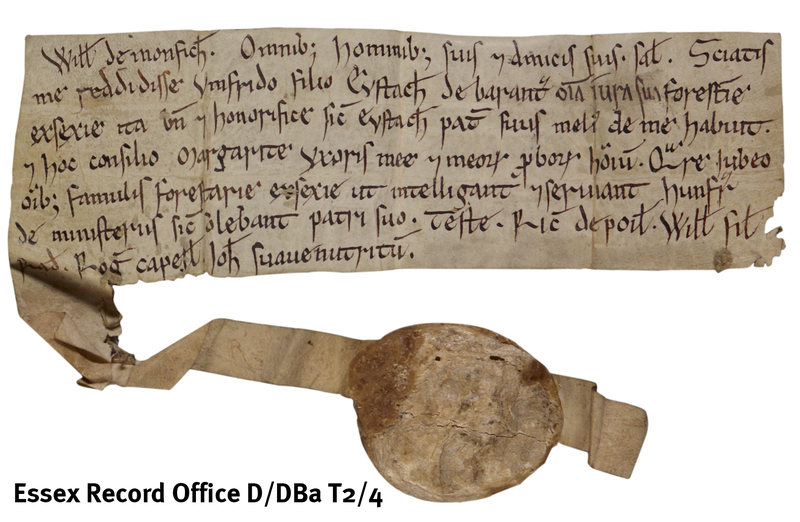 February’s Document of the Month is our oldest Essex document, a deed dating to c.1135-1138 (D/DBa T2/4). The deed is a grant of rights in the forest of Essex given by William de Monfichet and his wife Margaret to Humphrey, son of Eustace de Barentun. His father had previously held the rights in this deed. The grant is one of a series of this approximate date made to Eustace and Humphrey de Barentun by the Earl of Essex and William de Monfichet, which followed similar grants by the King. The de Barentuns, later the Barrington family of Barrington Hall in Hatfield Broad Oak, were the hereditary woodwards or keepers of Hatfield Forest. At this date the Barringtons were a minor family compared to the great barons who were descended from William the Conqueror’s most loyal supporters. 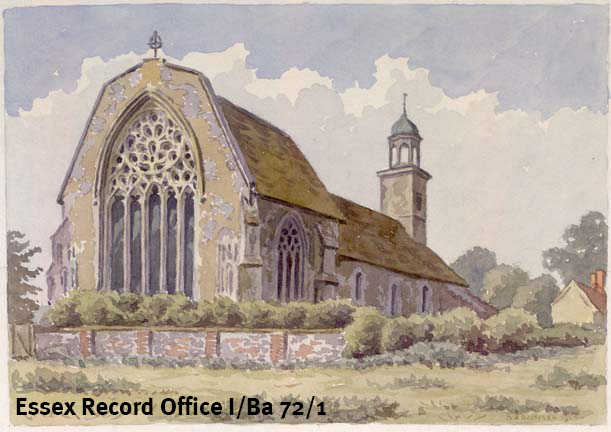 William de Monfichet and his wife Margaret were the grandchildren of two of the Conqueror’s supporters – Robert Gernon and Richard (de Clare) son of Gilbert, both of whom were well rewarded with extensive landholdings recorded in Domesday Book. The Monfichets held lands in Essex, including at Stansted Mountfitchet and claimed the hereditary right to be Keeper or Forester of the Royal Forest of Essex. William’s great-grandson Richard de Montfichet was one of the 25 Magna Carta barons chosen to ensure that King John abided by the terms of the charter. The deed will be on display in the Searchroom throughout February 2015.